Dear Pie, It has been a while, hasn’t it? It has been difficult to think about pie for the last few months because I spent the better part of a year writing two different cookbooks dedicated to the subject. From sweet to savory, and some pies that were a little of both, I was adrift in a sea of crusts, crumbles, and fillings with no end in sight. I love pie, but you can have too much of a good thing and I needed a pie hiatus. After formulating, testing, tasting, and photographing more pies than I care to recount, I honestly felt that if I looked at another pie I might do someone bodily harm. For the sake of my sanity, and my husbands safety, I made a clean break. During my break I wrote about all manner of pastry, and I even wrote a book about muffins, but I steered clear of pie. Now, with a clear palate, I am happy to report that my pie hiatus has officially ended, and it could not have ended in a better, tastier way! 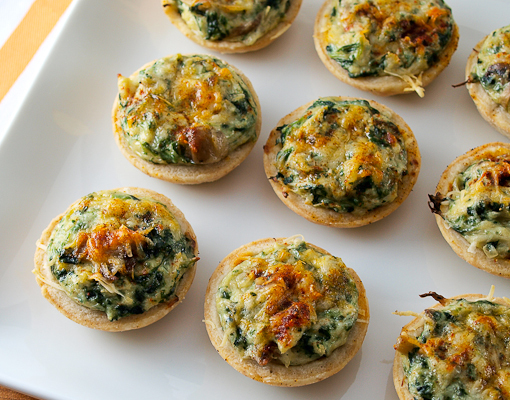 These little tarts were inspired by an exceptional spinach and crab dip I tried at a locavore restaurant in Dallas. The dip was served as an appetizer with wedges of charred flat bread and it was divine! After a few weeks of dreaming about the dip I decided to try making my own, but rather than serve it as a dip I decided to bake it into buttery pastry shells flavored with spices that compliment seafood. 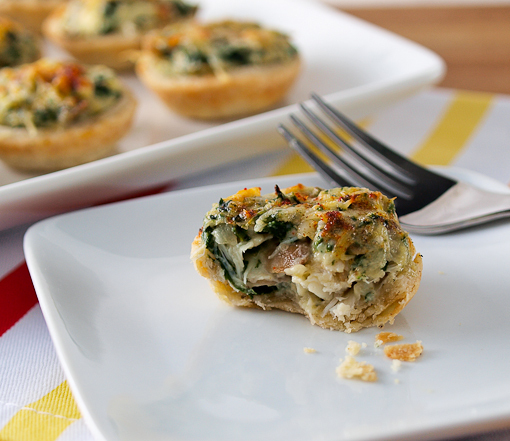 I wanted to keep the appetizer feel of the original dip, but I wanted the elegance of a perfectly sized mini-tart. 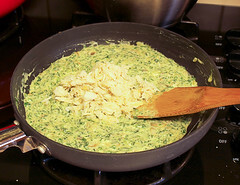 The crab is really the featured ingredient, playing off the creamy cheese, savory mushrooms, and earthy spinach. If you are not a fan of crab you could use diced shrimp, shredded roast chicken, or even chopped artichokes as a replacement. 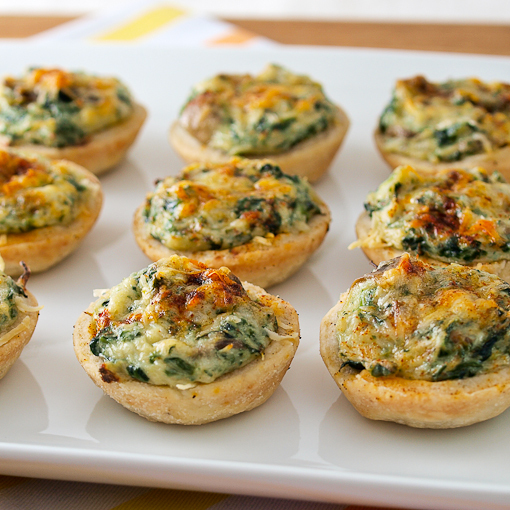 You can make these up a day in advance, just cover and chill once you stuff the par-baked shells with the filling, then finish baking just before you plan to serve them. These are lovely warm or at room temperature. In a medium skillet over medium heat add the butter and heat until it foams. 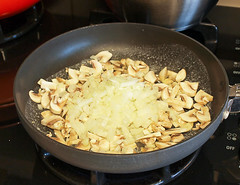 Add the mushrooms and onions and cook until they are tender, about 5 minutes. 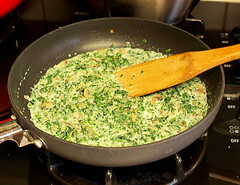 Add the garlic and spinach and cook until the garlic is fragrant, about 2 minutes. Season the mixture with salt, pepper, cayenne, and nutmeg then add the flour and cook, stirring constantly, for 3 minutes to cook out the raw flour taste. Add the milk and bring to a simmer, stirring frequently, until the mixture thickens, about 5 minutes. Once thickened reduce the heat to medium low and add 3/4 cup of the Parmesan, cream cheese, and mozzarella. Stir until all the cheeses are thoroughly combined then add the crab and mix well. Remove the pan from the heat and allow to cool while you prepare the crust. In a large bowl sift together the flour, sugar, and salt. 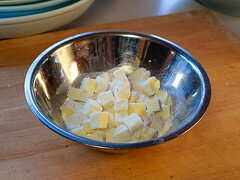 Add the butter and, using your fingers, rub it into the flour until the mixture looks like coarse sand studded with pea sized pieces of butter. Add the seafood seasoning and gently mix to combine. 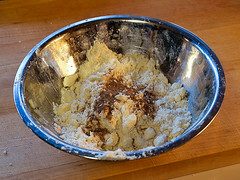 Add 3 tablespoons of water and mix until the dough forms a rough ball. Add more water, one tablespoon at a time, if needed, until the dough forms a smooth ball. 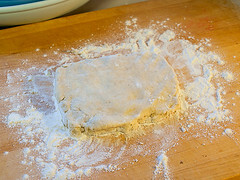 Turn the dough out onto a well floured surface and gently press the dough into a rectangle, then fold the dough in half and press it out again. Repeat this folding process two more times. Wrap the dough in plastic wrap and refrigerate for 15 minutes. Once chilled roll out the dough to 1/8-inch thick, about a 12-inch circle, turning the dough often to make sure it does not stick. Dust the surface with additional flour if needed. With a medium biscuit cutter (about 2 1/2-inches) cut out 24 rounds. You may need to re-roll the scraps to get to 24, but you can only do this once otherwise the dough may become tough. 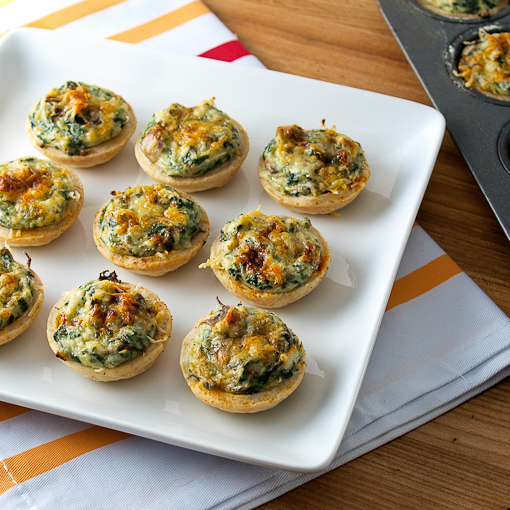 Press the dough circles into the cups of a mini-muffin pan and chill for 10 minutes. Bake the dough cups for 10 minutes, or until the dough is set but not golden, then remove the pan from the oven and divide the filling evenly among the cups. Top the tarts with the reserved Parmesan and a dusting of smoked paprika. 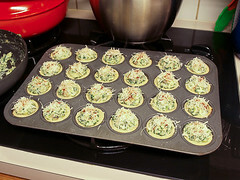 Bake for 12 to 15 minutes more, or until the tarts are bubbling and the crusts become golden brown around the edges. Cool the tarts in the pan for 10 minutes before serving. © 2012 – 2016, Evil Shenanigans. All rights reserved.